← What Can Brown Undo for Brown? Admen aren’t called hucksters for nothing. 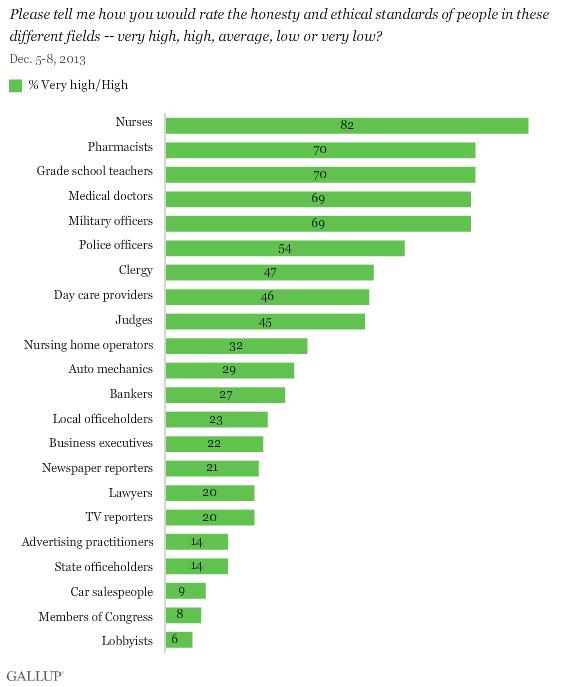 Exhibit Umpteen: They barely moved the needle in this recent Gallup poll on Honesty/Ethics in Professions. Everybody has an ad come-on they love to hate. 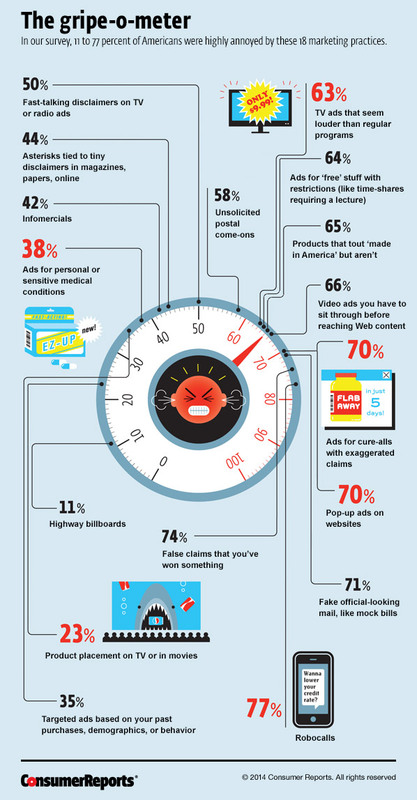 The top five, according to a recent nationally representative survey by the Consumer Reports National Research Center, are robocalls; false claims that you’ve won a prize or sweepstakes (Woody Grant, Bruce Dern’s character in the 2013 film “Nebraska,” would agree); bills that look real but aren’t; pop-up online ads, and hyperbolic ads for medical remedies. Least annoying of all the gripes we asked about: ads on billboards. It’s the right-hand side of the graphic that advertisers should focus on, yeah? As for the 63% who gripe about TV ads that seem louder than regular programs: That practice was outlawed by the Federal Communications Commission three years ago. Enforcement Sold Separately, we gather. This entry was posted in Uncategorized and tagged admen, car salesmen, Consumer Reports, Federal Communications Commission, Gallup Poll, Honesty/Ethics in Professions, hucksters, lobbyists, politicians, The Gripe-o-Meter. Bookmark the permalink.